Sweet boondi is also known as "Nukhti" in Sindhi. We usually make this as prashad during festive days and sometimes the fine variety of namkeen sev is mixed together with the boondi to balance the taste. The preparation is not very difficult if you get the consistency of the boondi batter right. Mix the gram flour, salt, baking soda and water to make a smooth batter of dropping consistency. Heat oil in a pan and take few spoons of batter on a flat ladle with small holes.Tap it to drop the boondi into the oil. Reduce the heat and fry the boondi until it is done. Repeat the same until all the batter is used up. Drain it on a kitchen tissue. Now take sugar in a pan. Add water, cardamoms, saffron and bring to a boil. Keep stirring with a spatula until it is thick and one string consistency. Tip in the muskmelon seeds and stir. When the sugar syrup is almost to the point where it starts crystallizing, add the fried boondi and stir stir quickly until the boondi is well coated. Leave it uncovered for a while and the boondi will soak up the syrup and each grain is separated. Stir it carefully to separate the grains..Add the pistachios. Allow it to cool and put it in a serving bowl. Garnish with dried rose petals and silver varq if you like. The boondi presentation looks amazing and I wish I was able to taste it!! I love sweet Boondi more than the boondi ladoo!! Thanks Mina.. wish I could send you some for tasting. I just wanted to reach out and touch the boondi they looked so good! 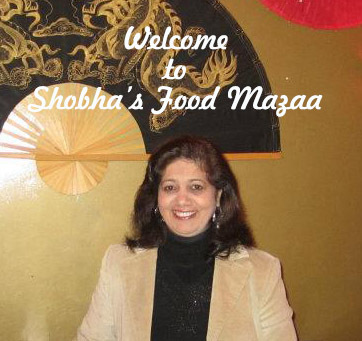 I simply love authentic Indian sweet dishes! These boondis look so perfectly done. My kids love boondi and always buy it on tuesday as that is the day when halwai makes fresh boondi for prasad. Your boondi is tempting me now. It is very easy Ritu.. do give it a try. I never tried making boondi, should do it sometime. Yours has come out well. I have grown up eating this. It was my favorite by I never knew it's so easy to make at home. Thanks Nandita.. must try it sometime. This is my all time favourite can have it anytime this looks so tempting. I love dry boondi. And you made it so perfectly. Bookmarking it. I wish I could taste your boondi. Lovely share. Thanks for the compliment Sujata. I love dry sweet boondi. I didn’t add baking soda in it and make boondi batter with milk, it will so soft and crispy. Love to eat with namkeen, yummy share. Ok. milk is also a good option .. will try that too. 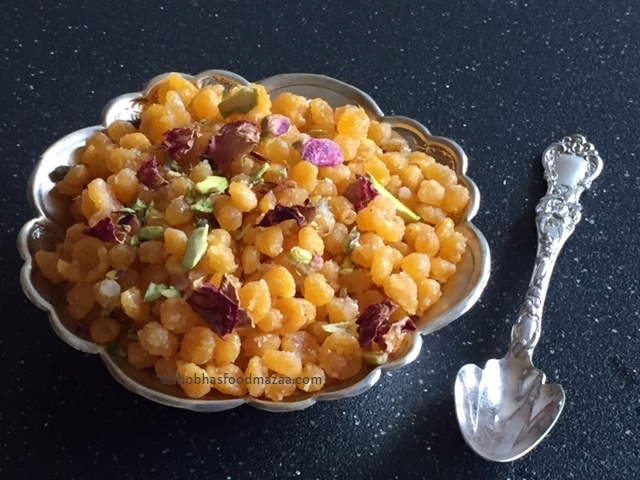 My mother in law use to make boondi often but I have to try making it at home. I like how sev is added to it to make it a sweet and savory treat. Yes Mayuri, we also add sev while eating.. even in the temples we get that as prashad. Such a delicious looking boondi. This is much more easier than making laddoos off it! I would have eaten up that whole bowl... Yum! Ohhh.... I love Meethi Boondis. Perfectly made boondis. Bookmarking this recipe. thanks for sharing. Looks delicious. Homemade boondi must be so much better than storebought version. I love sweet boondi. We usually make Ladoo. This is also good idea! 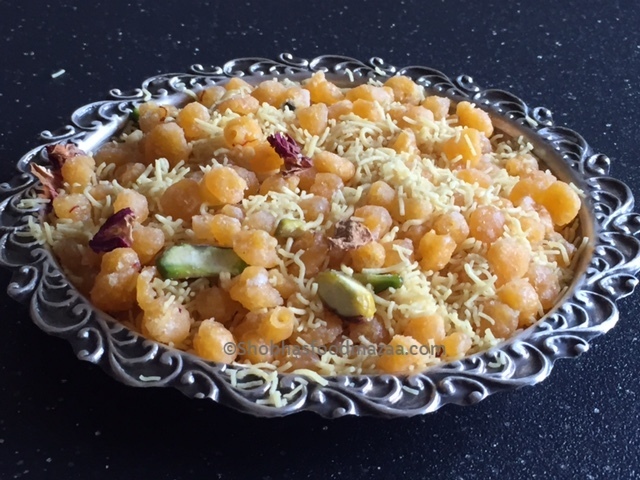 Sweet Boondi looks temptingly delicious and you have nailed it perfectly...All time favourite! !....Great share!! Thanks for the compliment Padma.